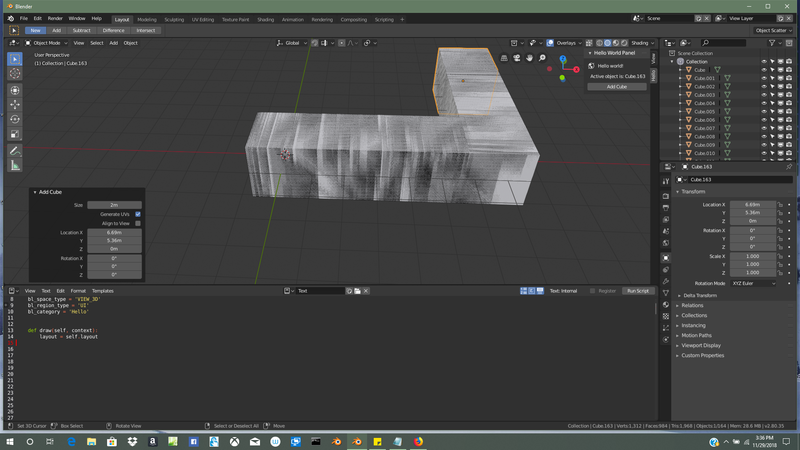 Running import bpy in text editor will make any mesh duplicate when location or rotation is changed. 3: Change the location or rotation of mesh and watch it make duplicates. rB43e7c5dd4342: Bump version to 2.80 beta. This isn't drawing artifacts. Look at the screenshot again, the outliner shows 10 duplicates and mesh data shows 161. It got duplicated 161 times. You can also watch the mesh data number changing in the video. Brecht Van Lommel (brecht) raised the priority of this task from Needs Information from User to Confirmed, Medium. Brecht Van Lommel (brecht) added subscribers: Campbell Barton (campbellbarton), Brecht Van Lommel (brecht). This seems like an error in the undo system, first guess would be it's related to the new unified stack so assigning to @Campbell Barton (campbellbarton). I can confirm this. For me this can already be achieved by just typing in the text editor (could be "foo", "bar" whatever doesnt need to be valid python). Dont even have to Run Script. Sebastian Parborg (zeddb) mentioned this in T60027: Operator Slider in 3D View Gets Interpreted as Backspace in Text Editor. Sebastian Parborg (zeddb) added a subscriber: Jorijn de Graaf (bonjorno7).